I may have passed a milestone. As anyone knows who bakes (or makes jelly, or brews wine), you start out by following the recipe. Plain old regular cooking allows more flexibility and free-styling, but with baking (and jelly making and home brewing) the quantities must be precisely right or the cake won't rise, the jelly won't jell, the brew won't ferment. It took a little time and a lot of success for me to start making up my own jelly recipes...knowing which fruit required extra pectin and where you could tinker with the sugar. Last weekend I tried my first batch of own-recipe wine. It won't be ready to bottle for at least a year, but so far, things look promising. I was inspired by the folks at Eminence Road Farm Winery. They joined the Barryville Farmer's Market this year and I was so excited to see they made an apple wine that I became a regular customer. I rarely buy wine because I have a closet full of decent home brew down cellar. But I wanted to support these guys and dammit, their wine was good! We traded a few bottles back and forth and when I told them about some apples I'd picked on a beach in NH last year, Andrew asked what kind they were. I didn't have a clue, but I knew they were wicked tart. He said old fashioned apples often make the best wines. 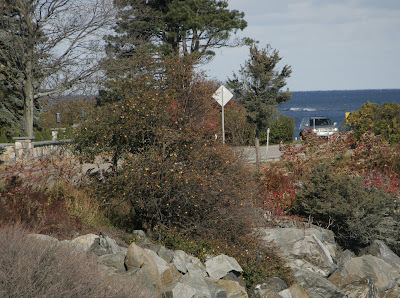 So this year, when I went to NH at the end of October, sister Sarah obligingly drove me back to Buoy Beach, where I picked 10 lbs of apples. When I weighed them I realized I had twice as much fruit as my recipe called for, so I decided to try something new. I cut all 10 lbs of apples into 1/8s, and simmered for 15' in a gallon of water, cores, skins, and seeds included. I realize this may give me a hazy wine (from the high amount of pectin) but there was no way I was going to core all those little green apples. Added a crushed campden tablet and let it sit overnight in a 5 gallon pail. The next day I dissolved 3 lbs of sugar in 1.5 quarts of water and added the sugar syrup to the apples. When the must settled at body temperature I added pectic enzyme, juice of two lemons, and some Montrachet yeast. In the past I've used champagne yeast, but these beach apples have aa assertive personality and I thought the Montrachet might be a better choice. Fermentation had begun by the next morning (last Sunday) and this weekend it was time to strain the must and transfer the juice from the primary (the pail) to the secondary (glass jugs). I've now got 2 gallons of apple wine fermenting away. They should start to clear over the next month or so, and as the spent yeast settles out, I'll rack the wine off the lees, hopefully ending up with 8-10 litres of vintage Buoy Beach wine. Time will tell. Oh boy. Now you really are talking dirty. Racking the wine off the lees. If I could choose, again, another career, I would have been a winemaker. But, unlike you, I have never made any. I am very impressed. Maybe someday, Marie, we can share a bottle. Just when I think I know your talents...and appetite for invention... you add one more thing. Hooray for apple wine. "Next year in Exeter"
I bet it will be delicious! And not to worry about the haziness: you can always add more pectic enzyme later to help clear it if you wish. Your apple wine was so wonderful - can't wait to find out what happens on the other side of this milestone! You're drawing some new connection (new to me, anyway!) between gardening and cooking, too - not just that wine's alive, and so are plants. Something about how time plays into these efforts. Good time of year for mulling on that sort of philosophical thing. Sara, perhaps you'll repeat your performance as wine judge when this year's vintage is ready for tasting. Oh boy ... I'm going to be really, really good or very, very bad so that I can get some of this. I love that they are found apples, too. It adds to the adventure. An apple pilgrimage sounds far nicer than walking on your knees in supplication. But then, I might beg for some of this.